The Oktobarski Salon, Belgrade’s biennial exhibition of visual arts, promises to be the biggest yet – with a high-powered roster of artists like Yoko Ono, Anselm Kiefer and Olafur Eliasson. The most significant visual arts event in Serbia, the Oktobarski Salon (October Salon), is returning on September 15 for its 57th edition – and is aiming high. The roster of international and local artists who will exhibit in the exhibition spaces, under the slogan “Marvellous Cacophony”, for its six-week run, is impressive. Artists range from veterans like Yoko Ono, Anselm Kiefer, Tom Sachs, Cindy Sherman, Vladimir Velickovic and Erro to some of the biggest names of the moment, such as Olafur Eliasson and Takashi Murakami, as well as young artists like Maja Djordjevic and Cao Fei. The salon theme aims to reflect the richness of the world in its countless facets but also to contextualize Serbia and Southeast Europe within a broader international socio-cultural scene. The participants and their respective works, therefore, have been selected to represent this particular richness and diversity and the positive creative explosion that is created when diverse and even opposing ideas are brought together. The cacophonous theme is also reflected in the diverse exhibition spaces. Beside the traditional home of the salon in the three galleries of the Belgrade Cultural Centre, KCB, at Trg Republike, the exhibits will be spread around the city in various places, from the grand spaces of the Museum of Belgrade in Resavska and the Gallery of the Serbian Academy of Sciences and Arts Gallery in Knez Mihailova to smaller alternative galleries like Remont (Marsala Birjuzova 7) and U10 (Kralja Milana 10). Besides installations, paintings and sculptures, the salon will offer participatory performances. Yoko Ono’s work for the salon has already drawn attention due to its participatory nature. She aims to discuss gender violence and has sent an open letter, inviting women in Serbia who have suffered such violence, to send photographs of their eyes and an anonymous account of their trauma. The material will be used in her project, “Arising”, which will be presented at the salon, offering a chance for catharsis and healing. Tom Sachs will launch five missiles from the Academy of Sciences and Arts, asking the audience to engage interactively in this work by tracking the missiles and marking them on a map. The launch will be streamed live from all available communication channels. This is the second time that the salon has taken the form of a biennale, headed by a prominent international curatorial team. 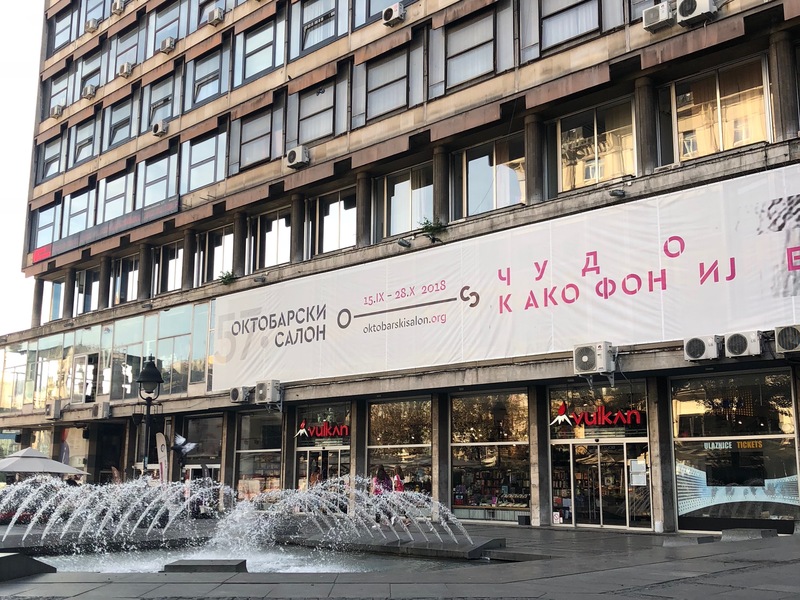 Gordana Goncic, acting director of Belgrade Cultural Centre, KCB, which organises the salon, is enthusiastic about the new format and sees it as a great opportunity for the city and its art scene. “Belgrade is the only city in the region that has an international exhibition of the visual arts in this format. Belgrade has the potential to be a centre of visual arts for the whole of Eastern Europe or the region, because there are no [regular] biennales between Venice and Istanbul,” she says.